The Viper Pro is the tip of the sword in the triathlon swimskin (aka "speed suit") market. In designing the Viper Pro, we relished the challenge of creating a swimskin that lives up to the ROKA standard set by the Maverick Pro wetsuit. We took the same uncompromising, ground-up design approach based on years of competitive swimming and triathlon experience, and we strategically incorporated all the latest advances in performance swimwear materials and construction. The Viper Pro swimskin is USAT and WTC legal and uses two varieties of the same premium stretch-woven textile from Italy, a hydrophobic Teflon® coating, high-tech bonded seam construction with novel hidden stitch reinforcement, a low profile autolocking YKK zipper and a pattern orientation and layout strategically designed to liberate your arms while providing support where you need it. We use flat seams at the leg opening to avoid "sausage legs" created by elastic bands with silicone grippers. All of these little details add up to free speed on race day. The Viper Pro comes with atomic yellow graphics. If you have a non-wetsuit race on your calendar, the ROKA Viper Pro offers the ultimate in swimskin performance. This suit was first out of the water in men's pro field in 2013 and 2014. 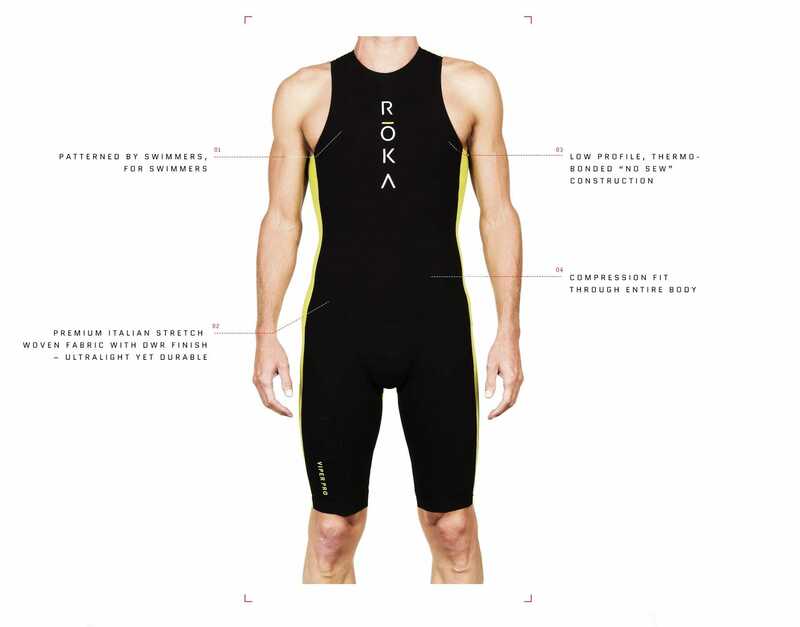 In 2015, almost 25% of the field at Kona wore ROKA Viper swimskins – more than any other brand.